Have you ever wondered what is the story of a person on your banknote? I collect many banknote with people faces on them who is a prominent figure in their society. This week, i will try to post some story about Philippine prominent figure that been displayed on their old pesos banknotes. If any of my story in here isn't correct, please feel free to comment and I will try to add that in this post. For today, I will share with you the story of Sergio Osmeña the second President of the Commonwealth of the Philippines; 4th President of the Philipines. 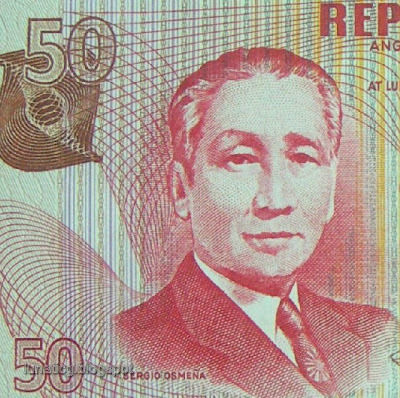 His face can be found on 50 limampung pesos or piso. He was a founder of Philipine Nacionalista Party. He born in Cebu City on 9 september 1878 and died in Quezon City on 19 October 1961 at the age of 83 years old. Osmeña became president of the Commonwealth on Quezon's death in 1944 (1st August 1944 until 28 May 1946). He returned to the Philippines the same year with General Douglas MacArthur and the liberation forces. After the war, Osmeña restored the Commonwealth government and the various executive departments. He continued the fight for Philippine independence. For the presidential election of 1946, Osmeña refused to campaign, saying that the Filipino people knew of his record of 40 years of honest and faithful service. Nevertheless, he was defeated by Manuel Roxas, who won 54 percent of the vote and became the first president of the independent Republic of the Philippines. Osmeña is the patriarch of the prominent Osmeña family, which includes his son (former Senator Sergio Osmeña, Jr.) and his grandsons (Senators Sergio Osmeña III and John Henry Osmeña), ex-Governor (Lito Osmeña and Cebu City Mayor Tomas Osmeña). His great-grandson, Tomas's son Miguel, is a student at the University of California, Los Angeles. His great great grandson, Christian Osmena, is a current Senator at the University of California, Berkeley.